Indicator has control panel and it will save every (chart & timeframe) settings. You can minimize it to have more space on chart and you can press close button to hide all indicator data on chart if you prefer to work with other analysis tools at that moment. When you use this indicator and change the settings, add indicators like Moving Average or Bollinger Bands, this indicator will save template of you edits automatically and you can load them any time you need. 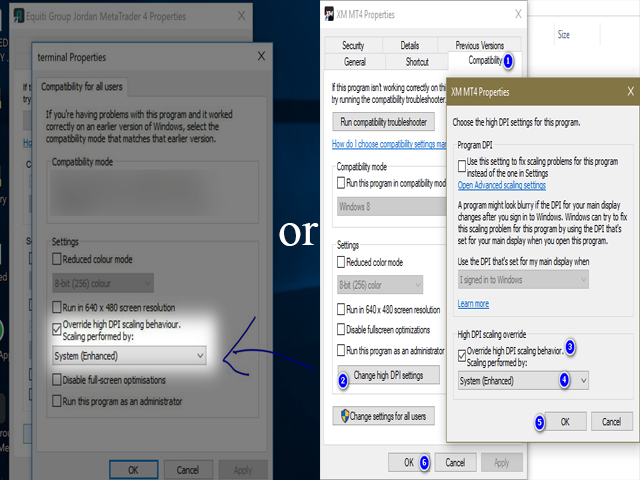 If you are using Windows 10, press right click on MetaTrader icon > Compatibility > Change High DPI Settings > System (Enhanced) to have best screen settings (it should be done in HD Devices). 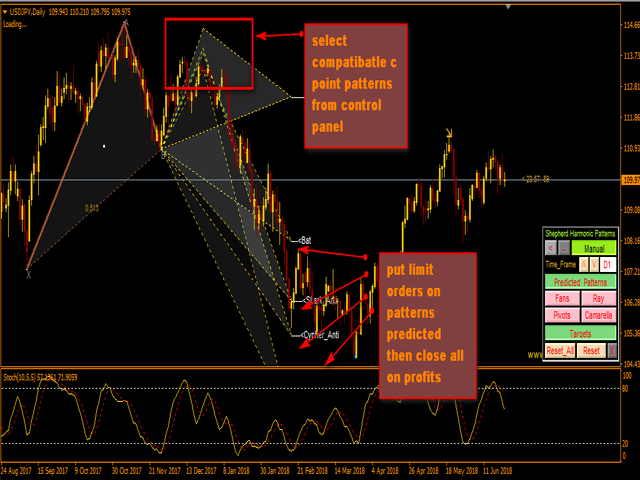 Indicator is simply an interpretation of harmonic trading theory for detecting harmonic patterns on the chart. If you want to learn it you can search for Scott Carney's book named "Harmonic Trading vol 1&2". Indicator has price and time alert lines. Indicator will draw Fibonacci fans on your detected patterns. 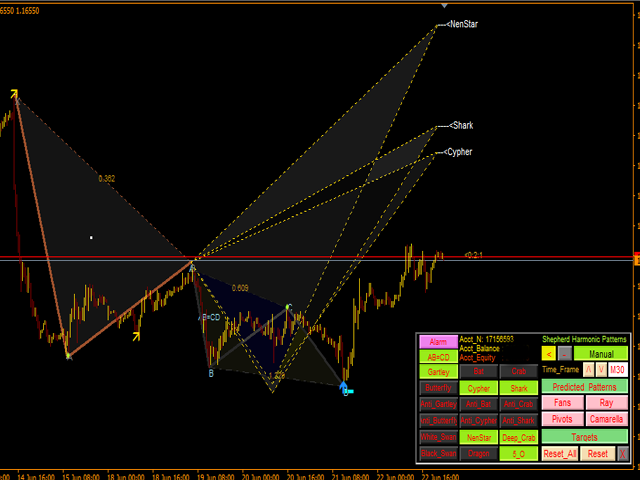 Indicator will draw Pivots/Camarella/Patterns Ray. You can load manually drawn objects from higher timeframes into lower timeframes. Reset buttons will clear all saved settings (All / Current) timeframe. Indicator has an alert / notification system that will provide you with targets/stop/entry points as signal. Indicator will detect divergence (yellow and orange arrows) and they serve as good confirmations. Indicator will calculate best lot size for every pattern as it is good for your balance with risk value as you insert in settings. Indicator will detect also price action patterns (Pinbar,InsideBar,OutSideBar). Use_System_Visuals - Enable\Disable indicator theme. Show_Last_Candle_Counter - Enable\Disable candle timer. Candle_Counter_Color - Color of candle timer. Accuracy_Percent - Percent for patterns proportions accuracy. Bullish_Pattern_Color - Color for bullish patterns. Bearish_Pattern_Color - Color for bearish patterns. ABCD_Color - AB=CD patterns color. Manual_Pattern_Color - Color of manual pattern. Show_Proportions - Enable\Disable patterns proportions view. Show_PRZ - Enable\Disable potential reversal zones view. Targets_Only_Completed_D - Enable\Disable show targets only on completed patterns. Font_Color - Color of texts. Fan_Color - Color of fans. Send_Alert - Enable\Disable alert function. Send_Notification - Enable\Disable notification function. Send_Email - Enable\Disable email function. InsideBar_Sensor - Enable\Disable InsideBar price action detecting. OutSideBar_Sensor - Enable\Disable OutSideBar price action detecting. PinBar_Sensor - Enable\Disable PinBar price action detecting. Risk_Percent - Risk percent to calculate with patterns stop loss value and account balance. History_Bars - Max bars that will be used in calculations. Great Indicador, gives you a lot of information if you know how to work with harmonic patterns. Great job .RECOMMENDED. 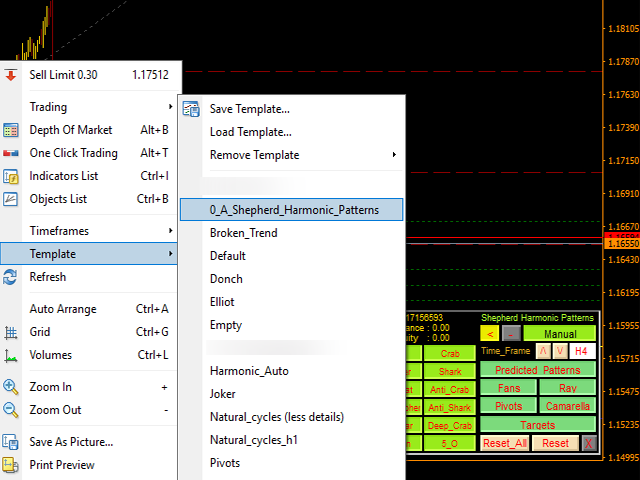 Best harmonic software ever. Just need to fix the alerts issue. I'm really impressed, i'm a 8 years experienced harmonic trader and this tool is just the best you can buy in the market, thank you Abdulah for your hard work. Once you understand all the features and how to use them this is the best harmonics indicator you can buy. I sent a private message, please check. I found this an unsatisfactory produce. I showed the owner suitable screen shots as proof. When I requested a refund, the owner denied it. It's been a long time since I was looking for an indicator like this, clearly well done. The author is really capable of explaining its operation and also giving clarification about the matter of harmonic patterns. You see that the author besides doing it for work also does it for passion. For several years I have been working on forex and I can honestly say that such precise indicators and such legitimate authors count on the fingers of a hand. I really recommend it! Still trying to figure the ins and outs of this system, but overall I like it :) Takes some getting used to the redrawing of the patterns. But with entry zones it makes it easier! Well .. thank u so much for such a remarkable indicator,its obvious that u did a great effort to reach this level of accuracy. 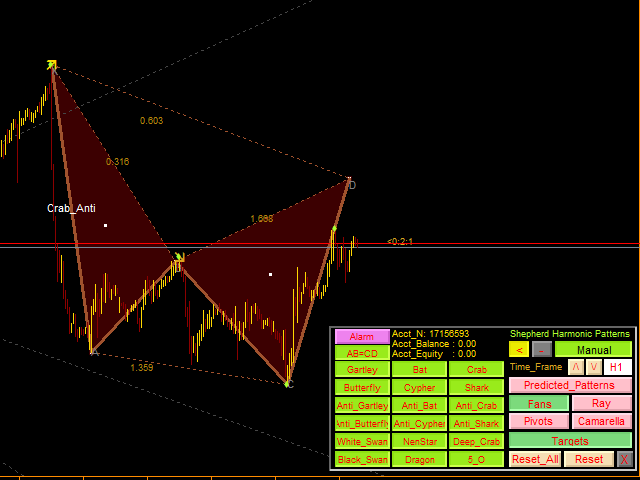 Very good indicator to finding Harmonic Pattern with accurate entry zone . Hello Abdullah, I give 5stars because of the people below and what I have see in the past detected patterns. I miss something in this indicator, which is very important to know. I can not sit the whole day, in front of the monitor. 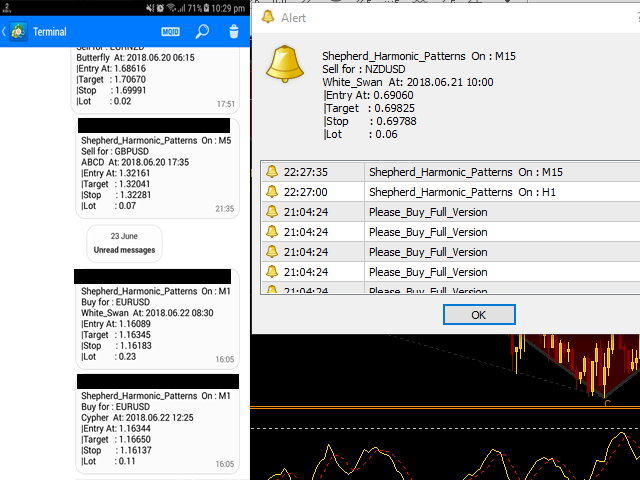 MT4 sends me the EMAILs, but only the time of the signal! 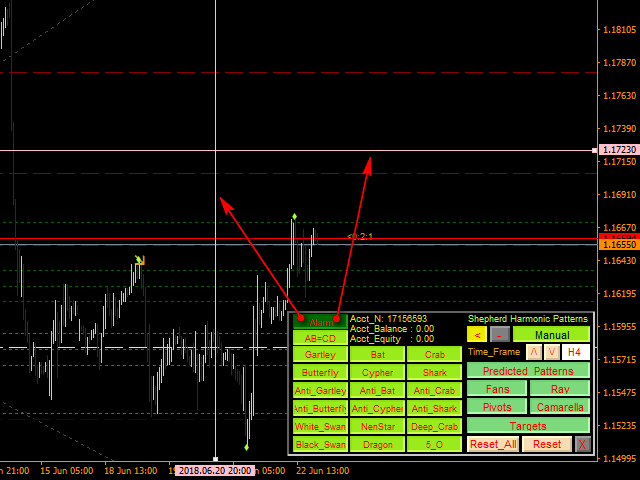 No profit targets, and where to put the SL. Would it be possible to ad those features? perfect indicator that works perfectly and very very helpfull guy.. what do you want more ?? 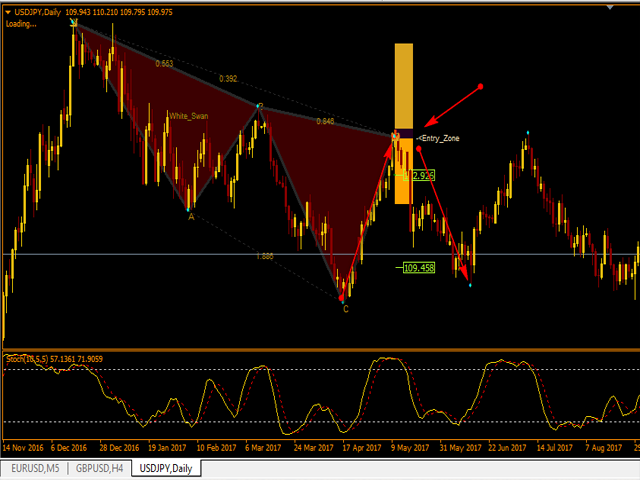 A very profitable indicator with a simple interface and accurate patterns. 1. Code rewritten and it is so faster now. 2. Added buffers to use within EAs. 4. Added Indicator Template to save its settings automatically in it. 5. Added Predicted And Manual Patterns Functions. 6. Add Pivots and Camarilla Lines. 7. Added Alarm for price and time lines. 8. Improved Alert and Alarms Functions. 9. Add money management system to calculate every pattern risk size. *Bug Fix change time frame error. 1 - Add new pattern 123 drives. 3 - Improve patterns drawing. 4 - Targets will appear only when pattern complete. 1. update panel now it will show you more info . 2. improved money management system that will be shown on panel . 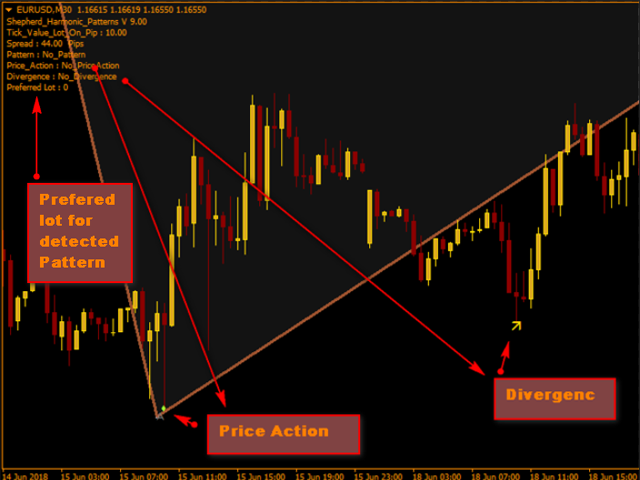 3. added divergence on RSI arrows with panel notify. 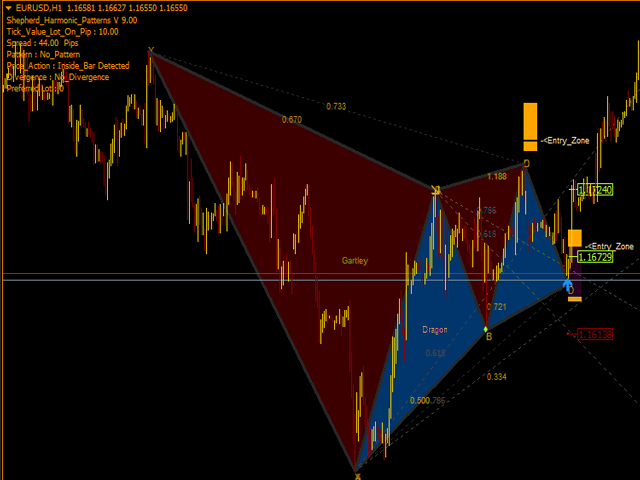 (Because of many harmonic traders using it). 4. added last detected pattern notify on panel . 5. more accuracy to view patterns. 6. Edited potential reversal zone areas (prz) and added entry zone this is the strongest one and from it price is hard to reverse.